I'm going to start an old project I've in the todo-list since I made that train depot for Es language board long time ago. It's a timeline depot set that will consists of several depot buildings for train, truck/bus and airplane. These are the first three: Federal Railroad depot, NorthLight road depot, Airbus Hangar. The first one... Airbus AirDepot, with four rotations and winter version. Northem Light road depot finished..intro year 1910. Four rotations and winter version with special night colors. Federal Rail Depot. intro date 1920, Four rotations with special night colors and winter version. Are these going to be included in next version of 64 as stock image? can they be used (adjusted and scaled) in other paksets? It's made from a Blender model, so in theory you can create a version for any pakset. I'll try to render a 128pak version..
EDIT: If someone wants to make some test (You need to divide them into front and back images)...link to pak128 version at g.s.c. City rail depot finished. It appears in 1950.. The new subway rail depot is already available..
and also the drive-through bus depot..
A new one: Yoodle bus depot. I had missed this thread, I'm sorry for the late message. 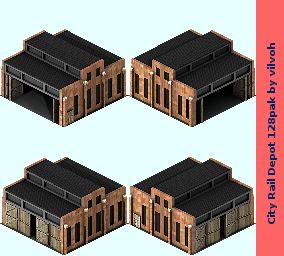 These depots are all great, and I like them very much When I have time again to work on my pak set, I'll contact you to get some of these into the set, too. The yoodle road depot is finished. It appears in 1926. Three finished: Woody, DHL and AiA. SOmehow I do not find them on graphics? Is the source to be found there? P.S: and this one makes 2k5...woot!! I was the first to download! Congratulations are perfect, you create the best add-ons! New train depots: Whibry and Greby. I'll make five more..
Goodness overload I really like them! PPS: I think you forgot to add snow on distant side of Whibry. Thank you so much for doing these! They're great! For me, the drive-through road depot will not place on a straight road, only on a dead end.